The 20th anniversary of the National Space Society in 1994 prompts us to look back on the history of the two organizations which merged to form the National Space Society in 1987. Most NSS members today have never been members of either of the two precursor organizations – the National Space Institute and the L-5 Society – and may not be aware of their history. See also the section on the National Space Institute in our online copy of the book Reaching for the High Frontier: The American Pro-Space Movement, 1972-84. In 1961 President John F. Kennedy launched the Moon race, which stunningly showed what American technology and determination could do. When, after eight years, we landed the first Apollo team on the lunar surface, the race was over. Just as serious scientific effort began, with immeasurable potential benefit to humanity, the funding closed down to a trickle. The last Apollo flights were canceled and America’s space momentum was lost. Long before the launch of Apollo 17, the last Moon mission, Wernher von Braun recognized that something had to be done to keep the importance of ongoing space activity before the public mind. The sort of organization that could do such a job would need to be independent enough to view critically all aspects of NASA policy and implementation. Terry Dawson and six others formed the National Space Institute, a nonprofit educational membership organization. Von Braun asked me to join the Board of Directors during the formation of the Institute and I became Vice President in 1974. When Wernher’s illness became serious, I was elected President. After the merger with the L-5 Society in 1987, as the National Space Society, we began to move forward at a better pace, and I have had the pleasure of chairing the Board of Governors. I am pleased and proud to say that this Board has been more actively involved than any Board of Governors I have been associated with. The 1989 meeting in Scottsdale, Arizona, heard member Tom Paine, (NASA Administrator 1968-70), cite “favorable prospects for international cooperation in the 21st century.” He believed the Cold War would end without nuclear Armageddon, that declining military expenditures would free capital, enabling international organizations like Intelsat to “bring nations together in challenging high-tech enterprises.” He foresaw the terraforming of Venus and Mars with such techniques as genetic engineering of bacteria, and the birth of long-range plans for launching robotic probes to temperate planets circling nearby stars. In 1991 the governors met in Washington, D.C., and attended a celebration of the 30th anniversary of Alan Shepard’s suborbital flight. Two years later, NASA Administrator Dan Goldin addressed the governors, bringing them up-to-date on the status of the Space Station project. Robert Bocek of McDonnell Douglas briefed the Board on promising technologies for single-stage-to-orbit launch vehicles. The Society has done very well since the merger. Its eighty chapters around the world continue to be very active. Our views on space policy are sought after in Washington; we are regularly asked to testify on Capitol Hill and are often quoted in the media. Renowned TV personality Hugh Downs is Chairman of the Board of Governors of the National Space Society. 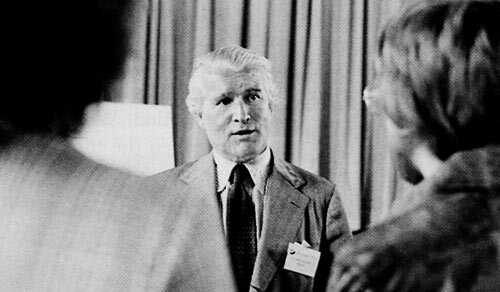 Wernher von Braun talks with NSI members at the first annual meeting held in Cocoa Beach, Florida, in July 1975. When first approached in 1972, Wernher von Braun was briefly hesitant about a National Space Institute. “Another talking club,” was his spontaneous reaction. Then, for a change, he found himself on the receiving end of a campaign of persuasion and he was converted – in fact he became the most active, persuasive, and successful promoter the Space Institute ever had. The Institute was officially incorporated as the National Space Association in June 1974. The articles of incorporation were written and filed by Harry S. “Terry” Dawson. Von Braun was elected President in August of that year, and Charles Hewitt was appointed Executive Director on 1 December. Because there were so many associations on the Washington scene, the name was changed to “National Space Institute” in April 1975. Despite health problems, toward the end of 1975, in an interview with Washington Star staff writer Vernon A. Guidry, Jr., von Braun took the opportunity to make a pitch for the NSI. “You are president of the National Space Institute,” Guidry began their conversation, “and you’ve said that its purpose is to create broad public support for a more energetic space program…. Do you really have a high chance of success?” “Well,” von Braun replied, “I’m fully aware that public interest is a very fickle thing. One day, the word is ‘Moon or bust,’ and the next day it is ‘let’s clean up the rivers.’ People get so much information today that the priorities in [their] minds swing back and forth. The Apollo flights to the Moon were demonstrations of immense capabilities and potential, but in some respect they may be compared with Lindbergh’s flight across the ocean. I think space is now entering a maturing period where it will be less gee-whiz, less sensational, but it will become more a part of everyday life – just like the airlines. When von Braun died in June 1977, Hugh Downs became Chairman of the Board and after a time Ben Bova assumed the presidency. After Hewitt departed in 1980, Courtney Stadd served for a period as General Manager. The Institute was then led in turn by executive directors Dr. Mark R. Chartrand (to 1984) and Dr. Glen P. Wilson. Frederick I. Ordway III was a founding member of NSI and is a former member of the NSS Board of Directors. Portions of this essay appear in Chapter 12, The Fairchild Years,” from Ernst Stuhlinger and Frederick Ordway’s Wernher von Braun: Crusader for Space (Krieger, 1994). All quotations were extracted from interviews conducted by Ordway between 1985 and 1989. I came to NSI as Executive Director in the fall of 1980. In that year, before the first flight of the space shuttle, there was some hope that the space program was on the rebound after the post-Apollo cutbacks. The membership level was at an all-time high. NSI membership activities and direct benefits, on the other hand, were at an all-time low. The Board of Directors was, for the most part, moribund. A very few members of the Board, notably, Harry S. Dawson, James Fletcher, Edward Z. Gray, Earl Hilburn, and Hugh Downs, were concerned about the organization. Membership numbers were at a high point because during 1979 NSI had made an agreement for a direct mail campaign with Kathy Keeton, publisher of the new science magazine Omni, to offer a package combining NSI membership with an Omni subscription. While many people signed up, when the time came to renew they had little commitment to NSI, and renewal rates – the lifeblood of any membership group — fell dramatically. I embarked on three major efforts: to revive and revise the Board of Directors into a more productive body, to begin to provide some real membership benefits, and to restore NSI’s position as the premiere public space advocacy organization. Membership benefits were a problem, because this meant spending money. With the advent of space shuttle flights, I began the shuttle launch tours enjoyed by hundreds of members. We began a series of quarterly membership meetings around the country, taking NSI to the members, with talks by astronauts and other space experts. Over the years, several thousand members attended these gatherings, often held at NASA facilities. We needed to strengthen NSI’s image in the eyes of policy makers and we also needed our own regular publication. Courtesy calls were made to NASA officials, members of Congress, senators, and aerospace executives. We renewed contacts with other space organizations and we talked to congressional space committee staff arranging to testify before relevant committees and subcommittees on space issues. The strategy worked: the National Space Institute came to be viewed as an unbiased source of information to government, industry, and the press on space. In 1982, we approached the largest circulation space magazine, Space World, about a joint endeavor. Space World became our official publication and the major membership benefit of NSI. Some years later, the Society introduced its own publication, Ad Astra. One other major activity was the Dial-A-Shuttle program. NSI was approached by NASA to take over a program which the agency had begun to provide live coverage of shuttle missions to news organizations. Anyone could call a 1-900 telephone number and listen to communications between Mission Control and the astronauts. Unfortunately, callers often heard nothing because the shuttle was out of range (up to 80 per cent of the time during early missions!). NSI took over the program and added live commentators. During some missions, as many as five million people from all over the world called Dial-A-Shuttle and the program garnered great publicity for NSI. Among the people who became associated with NSI during the early 1980s was Dr. Glen P. Wilson. As a staffer for Lyndon Johnson in the Senate in the 1950s, he had helped to write the NASA Act. He went on to become head of NASA’s Education Office and when I decided to step down in 1984, Dr. Wilson took over as Executive Director of NSI. Dr. Mark Chartrand, Executive Director of NSI from 1980-84, is a consultant and freelance writer in Baltimore, MD. “We’re running on empty down here,” I wrote to Ben Bova and the NSI Board in 1984-85 – the NSI was chronically short of funds. One thing that kept us alive through that period was a small contract with NASA to help establish the Young Astronaut Council in which the Reagan White House was very interested. Our reputation in Washington was enhanced because of the professional way in which we handled our end of the bargain. John Yardley, Vice President of McDonnell Douglas, and a group of high level aerospace executives wanted to find a way for the aerospace industry to assist in building a non-government, non-industry, membership group to help promote and support the nation’s space program. They hired a consulting firm which, after considerable study, recommended that the NSI be core organization for this group. We began to plan for a major membership campaign. Unfortunately, our first mailing was just about ready to go at the time of the Challenger accident and the next year was filled with NASA bashing. Nevertheless, we were able to build the membership from a low of about 7,000 to 12,000. Negotiations had begun with the L-5 Society for a possible merger. The NSI had a strong presence and good reputation in Washington, while the L-5 Society was better known for its many activist chapters around the country and its annual space development conferences. It seemed like the perfect marriage but negotiations were difficult and drawn out, and the merger was not formalized until April 1987. The merger brought the L-5 staff of three from Tucson, which was more than we could accommodate in our rented offices across the street from NASA in Washington, D.C. We prevailed upon the Wernher von Braun Foundation (a supporting foundation of the NSI) to supply the necessary funding for the down payment on a new headquarters building on southeast Pennsylvania Avenue. We moved in during June 1987. One of the most contentious points of the merger negotiations was the name of the new organization. The matter was put to a vote of the membership and in the spring of 1988, by an almost two-to-one margin, the National Space Society was chosen over the Space Frontier Society. Glen P. Wilson was Executive Director of NSI from 1984-1987 and Executive Director Emeritus thereafter.